Naruto: Shippuden is an anime series adapted from Part II of the Naruto manga series by Masashi Kishimoto. 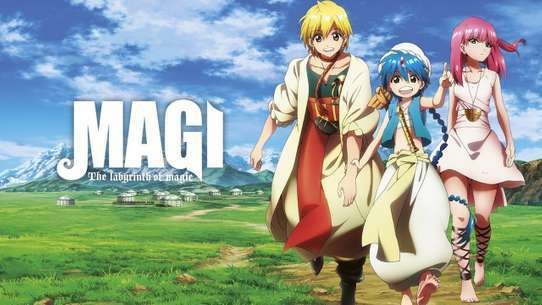 The series is directed by Hayato Date and produced by Studio Pierrot and TV Tokyo. Naruto: Shippuden is a continuation of the Naruto manga, and continues the same storyline after the passing of two and a half years in the Naruto universe. It began broadcasting on TV Tokyo on February 15, 2007. 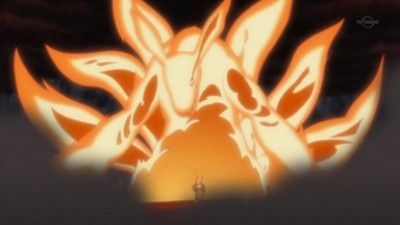 The Nine Tails, having been released from Madara's control, continues to wreck havoc in the city. 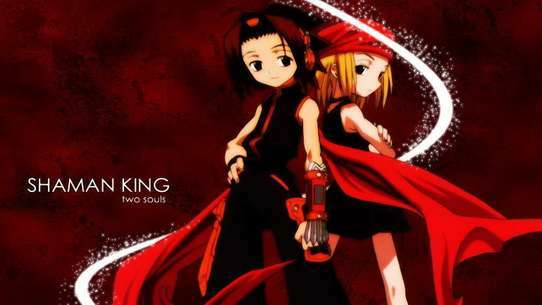 The Third Hokage summons the Monkey King Enma and drives the Nine Tails away from the city. Minato then returns to the city and with the help of the toad Gamabunta is able to restrain the Nine Tails long enough for him to teleport it along with his family to the outskirts of the village. Kushina binds the Nine Tails and as Minato prepares to do the Reaper Death Seal to seal away half of the Nine Tails Chakra and seal the rest inside Naruto using the Eight Trigrams Seal. 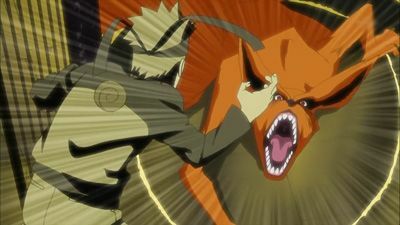 He also seals a bit of Kushina's chakra to help Naruto tame the Nine Tails. All of this is witnessed by the Third Hokage and a few other ninja. 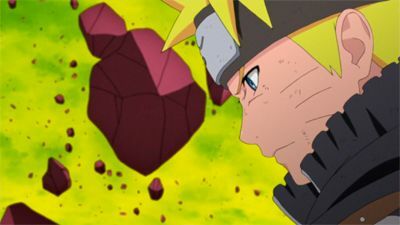 Naruto succeeds in removing and destroying Son's chakra receiver, but is upset on learning that Son still isn't free. Son leaves him a gift before being resealed into the Gedo Statue. Intent on going full-out, Tobi has all the other jinchūriki fully transform into their tailed beasts. Kurama offers to lend Naruto more of its power, and is annoyed that Naruto thanks it for the earlier help against Madara. Naruto and Kurama meld their chakra, and Naruto notifies B and Gyūki that they still have a lot of power left to use. Gyūki wonders if Naruto and Kurama are cooperating. Naruto acknowledges Kurama as a comrade from the Hidden Leaf, opening the gates restricting it. Newly empowered, Naruto deflects five Tailed Beast Balls fired against Guy and Kakashi, changes into a full tailed beast form, and begins attacking the tailed beasts, having created a clone to locate their chakra receivers. The five tailed beasts make a collaborative Tailed Beast Ball, which Naruto matches with one of his own, sending the attacks into the sky. 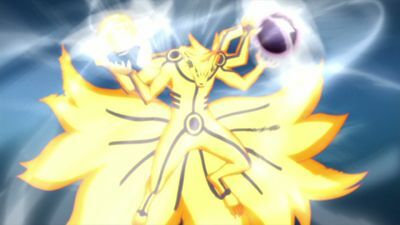 He sends clones through Kurama's chakra arms to remove the chakra receivers. Upon touching them, Naruto finds himself in a mental plane, along with Kurama, the other tailed beasts, and their jinchūriki. 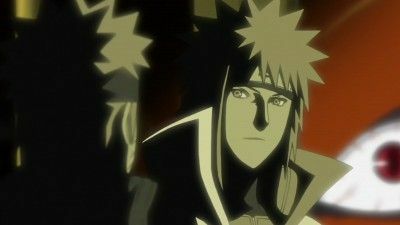 They talk, all of them introducing themselves to Naruto, and telling him about their earlier talk with Rōshi and Son. 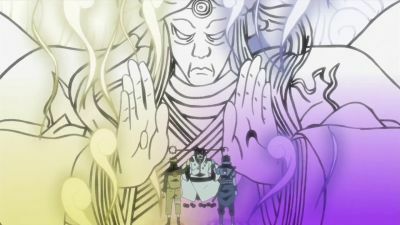 The tailed beasts each gift Naruto with a bit of their chakra, and Kurama recalls their last moments with the Sage of the Six Paths long ago. As Naruto removes the chakra receivers, Kurama asks the others if they agree that Naruto is the one the Sage spoke of, to which they agree. 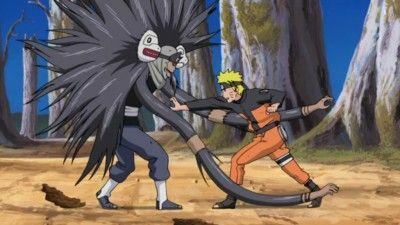 Naruto's tailed beast transformation ends, and Tobi reseals the other tailed beasts into the statue again, noting that nothing about Naruto's predicament has changed. Naruto denies this, explaining he learned many difficult names. 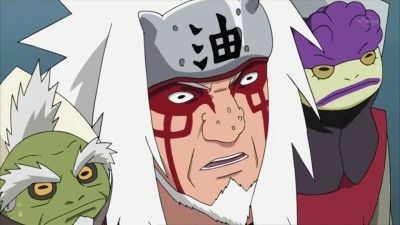 Jiraiya realizes that the six Pains are all ninja he's met before. 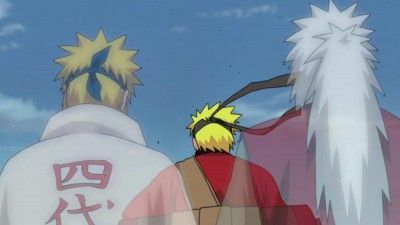 Putting various pieces of information together, Jiraiya figures out Pain's true identity, but Pain doesn't intend to allow Jiraiya to leave with that information alive. Elsewhere, the fated meeting between Itachi and Sasuke arrives, and Sasuke foresees Itachi's death. 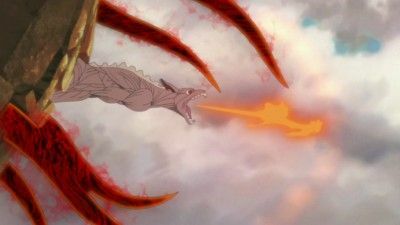 Naruto's rage pushes him to unleash six of the Kyubi's tails against Pain. In order to combat this menace, Pain is forced to rely upon his most powerful technique to stop Naruto. Will Pain succeed in defeating Naruto, or will the most unexpected of allies appear to calm Naruto down? #5 - The Fourth Hokage's Death Match! Kushina successfully delivers Naruto but their celebration comes short when Madara suddenly appears and kills Taji and Biwako. Madara attempts to kill Naruto but Minato quickly saves Naruto from explosion, and as Minato fled and put Naruto to safety Madara manages to release Nine Tails from Kushina. Madara takes control of the Nine Tails by using his Sharingan and tries to eliminate Kushina, but quickly saved by Minato and being brought back to Naruto. Madara summons Nine Tails to start the carnage over Konoha and Minato prepares himself to face Madara. As Minato arrives in Konoha and Nine Tails' Tailed Beast Ball was being absorbed, Madara appears on Minato and tries to grab him however Minato teleports and been easily followed by Madara. Minato and Madara start their clash, and Minato cleverly defeats Madara using his Rasengan and applying the contract seal to remove control on Nine Tails. The Fourth Hokage appears in Naruto's mind and prevents him from foolishly setting the Kyubi free. 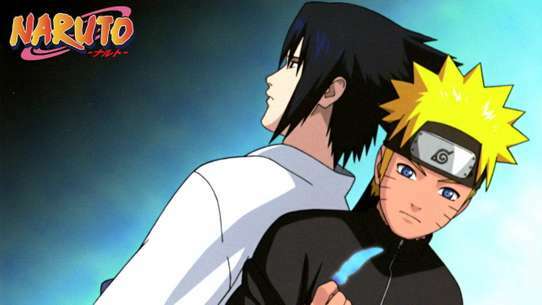 Will this confrontation between father and son give Naruto the confidence he needs to stop Pain once and for all? Deciding to believe in Naruto, Nagato uses the Gedo Art: Rinne Rebirth jutsu, expending the last of his chakra, and thus giving his life, to revive every person in the village who died in the attack, saying that it's the least he can do. With Nagato dead, Konan leaves Akatsuki, taking Nagato and Pain's God Realm (who is actually the body of Yahiko) with her, parting with Naruto saying that since Nagato believed in him to achieve true peace, she will as well. 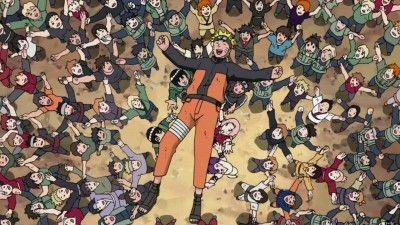 As Naruto returns to the Leaf, he is astonished to find the entire village awaiting his return, hailing him as a true hero. After all these years, Naruto has finally received the acknowledgment he's always wanted. Back at the front lines, the five Kage struggle to hold their own against Madara's Susanoo-clad wood clones. Despite these great odds, Ōnoki rallies them to fight, noting that they need to fulfil a task at which cannot be failed. Madara realises that Ōnoki is the problem and that he must break his will. With that, the Kage go on the offensive against Madara's clones once more. 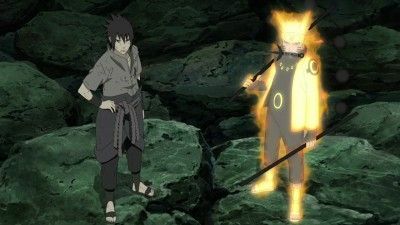 The situation soon takes a turn for the worst as Madara in turn responded with his full power by activating his final Susanoo and proceeds to using its sword to attack them. Elsewhere at the cave, Itachi commands Kabuto to put an end to the Impure World Reincarnation, during which time Sasuke states his resolve to destroy the village that made his brother suffer for so long while bidding farewell to Itachi altogether. As the lights surrounding the reincarnated shinobi begin to illuminate the battlefield as they faded into pillars of light, Itachi approaches Sasuke and uses his Sharingan to show Sasuke everything about the Uchiha clan massacre. 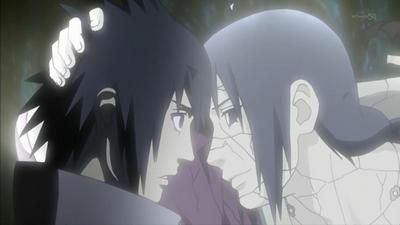 With the truth revealed to Sasuke at last, Itachi then imparts his final words to his brother, stating that no matter what happens or what he does from here on out, he will love him always. 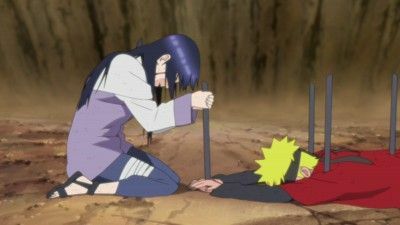 As Pain tells Naruto about why he does what he does, Hinata appears on the scene and confesses her feelings to Naruto. In order to save him, she attacks Pain... Things are about to get messy and Naruto is about to go over the edge! 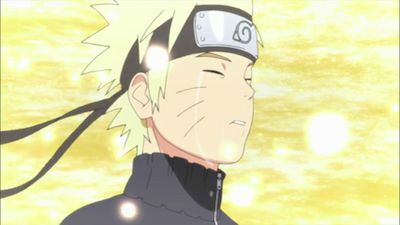 Naruto successfully begins taking out Pain's bodies one after another, but when his Sage Mode reaches its limit, Pain attempts to take control of the battle. Is the moment of Pain's victory at hand, or does Naruto have a plan? Naruto uses shadow clones to distract Sasuke while one clone amasses nature energy to fight back against Sasuke's Perfect Susanoo. 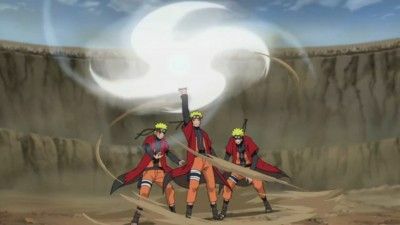 Once ready, the clones merge into a single avatar and create two huge Rasenshuriken. Sasuke is delighted that Naruto is finally getting serious but Naruto shouts he wants to win against Sasuke fairly. 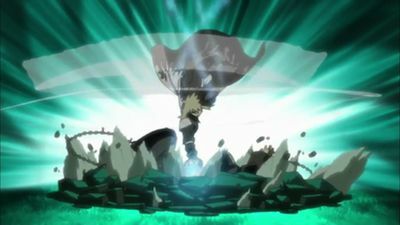 Naruto's attack and Sasuke's Indra's Arrow collide, creating a titanic explosion and hurricane-like vortex that devastates the Final Valley and its surrounding forest, including decapitating the statues. Drained of chakra, they resort to taijutsu. Sakura wakes up from Sasuke's genjustu and learns of their battle. The battle between the two boys continues on until they are both so exhausted and injured that they can barely stand. Despite being exhausted, Sasuke uses his Rinnegan's power to absorb the chakra Kurama amassed for Naruto and prepares to kill him, but Naruto counter-punches him due to Sasuke running out of enough energy to keep his Sharingan active. 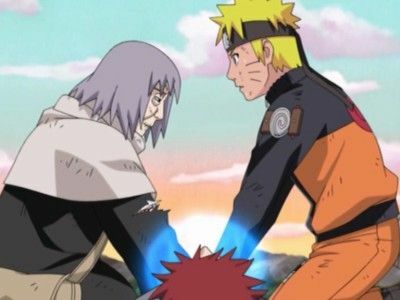 Sasuke prepares a Blaze Release Chidori to end the battle and Kurama hands over the last of his chakra by fist-bumping with Naruto, and remembers when Naruto vowed to eliminate Sasuke's and the tailed beast's hatred. Naruto creates a Rasengan while imagining all his friends helping him. Their attacks collide and the resulting explosion destroys the remaining statues and engulfs Naruto and Sasuke. The Sound Four get resurrected, but are they strong enough this time around to make a stand against the Konoha ninjas? Chiyo uses her abilities as a master puppeteer to allow her to control ten puppets at once against Sasori. However, Sasori has gone a step ahead, and gained the ability to control one hundred puppets at once! Can Chiyo defeat the man who took down an entire country? Naruto's initial attack is ineffective against the beast but wasting no time he flips the beast over and launches a Rasenshuriken at it. He immediately tries to separate the beast's chakra but the beast's hatred and malice begins to fill him. While in the training chamber, B alerts Yamato who begins to attempt to suppress the beast. As the hatred fills him he is reminded of the people that spurned him in his childhood but a small gentle voice rings out telling him that he could stay there. With that chains erupt from Naruto's body and restrain the beast who recognises them as Kushina Uzumaki's. Within Naruto's mind a kind-faced woman with long, bright red hair appears before him who Naruto initially believes to be the Nine-Tails trying to deceive him. After Kushina brutally corrects him — realising who she is — an emotional Naruto greets his mother. 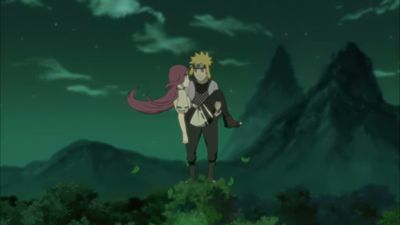 With this, the two begin to talk and Kushina tells Naruto of her youth and how she fell in love with Minato Namikaze. Kakashi continues to fight against Pain. With the arrival of Chouji and Chouza, things start looking up, but Pain's not out of tricks just yet. As Onoki and the remaining Fourth Division members tackle both Madara and Mū, Tsunade and A make preparations of heading to Madara's location in a very risky gambit with Mabui's Heavenly Transfer Jutsu, which would likely kill them as it is meant for transporting objects. However, Tsunade decides to take the gamble using her Reverse Seal: Release. 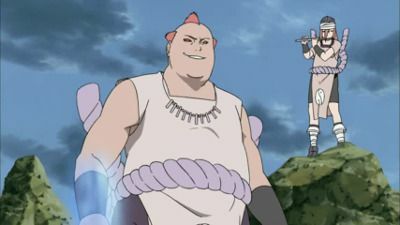 Shikaku telepathically communicates to Genma to have him, Raidō and Iwashi to perform the Flying Raijin Justu to transport Mei to Madara's location as well after Black Zetsu is kept at bay by Naruto long enough for Chojuro to defeat the inhuman being. 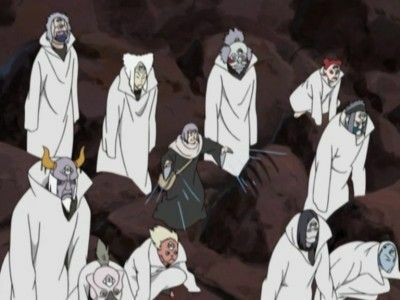 When the other Kage arrive at the battlefield, Tsunade heals Gaara and Onoki while A and Mei engage Madara as Dodai and the Hokage Guard Platoon chase after the Kabuto-controlled Mū. 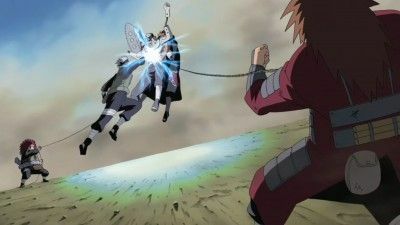 Once healed, the two saving A and Mei from their enemy's Yasaka Magatama, Gaara holds Madara at bay while Onoki joins the Kage under the cover of Mei's Hiding in Mist Jutsu to use a jutsu that effects A's weight so he can knock Mū and Madara a distance away. Though Naruto wants to help, Tsunade tells the boy that they will deal with Madara while he goes after the "other Madara". As the clone disperses, the Kage leave him one word: "win". Naruto and Sasuke perform the sealing Six Paths - Chibaku Tensei on Kaguya to seal her away. She reverts back to the Gedo Statue and the tailed beasts, including Madara, are freed. Son Goku compliments that Kurama's jinchuriki really gets it done and Kurama agrees. Kaguya is imprisoned in a levitating satellite as Sasuke tells Sakura and Kakashi that Naruto still had something to do but they needed to get far away. Black Zetsu says he will still find a way to revive Kaguya and mocks the shinobi world again. Naruto berates it for its words and throws it to the satellite, sealing it with Kaguya. With the sealing complete, Team 7 wonders how they can escape the time-space. 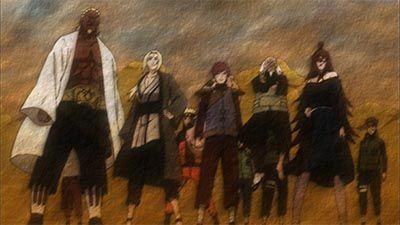 Hagoromo and all the previous Kage bring Team 7 and the tailed beasts back, and Hagoromo congratulates them for saving the world. Hashirama and the dying Madara reconcile and Naruto shares a final goodbye with his father Minato, who wishes him a happy 17th birthday and promises to tell Kushina everything Naruto has told him. All the Reanimated Kage return to the Pure Land. As the opposing sides converse, the Fourth Kazekage is shocked to learn that Gaara was no longer the host of the One-Tail, and even more so that he had friends and had become the Kazekage. Intent on testing his son's mettle, the two begin battling while Ōnoki signalled the troops to move in before confronting Mū. As the battle waged on, the Fourth Kazekage is shocked to find himself trapped in Gaara's attack alongside the Second Mizukage and the Third Raikage. 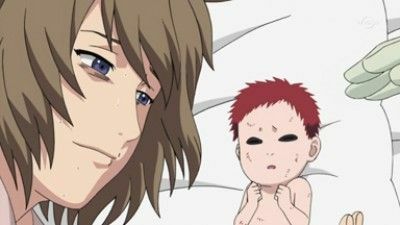 Seeing the sand manifest in the form of his late wife after protecting Gaara from one of his attacks, the former Kazekage realises that Karura had been protecting Gaara his whole life. Remorsefully, the Kazekage tells his son the truth of his mother's love for him and apologised that all he had done for Gaara was rob him of happiness, now realising that he had actually been unable to judge the true value of things in the end. Shocked to hear the truth of his mother's love form him and what Yashamaru had been forced to lie to Gaara and say, the young Kazekage breaks down crying. Gaara would later tell his father that while his mother was truly amazing, it was his father who had finally given him medicine to heal his wounded heart. With Gaara forgiving him for his past mistakes, the Fourth smiles on as he is sealed away by his son, entrusting the village, and the future to his son. Naruto returns and discovers that the village has been devastated by Pain's Shinra Tensei attack. Naruto requests that everyone stays back as he prepares to take on all six paths of Pain at once. #23 - Naruto vs. 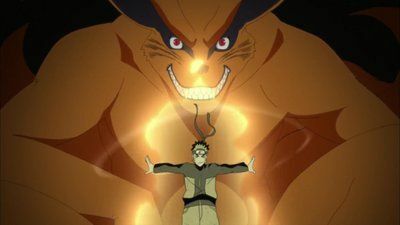 The Nine Tails! With Killer Bee as his new master, Naruto begins his training to control the power of a Tailed Beast. In order to do so, one must fight the Tailed Beast head on and absorb its chakra, converting it into one’s own power. Gaara's body has finally been recovered, and Chiyo determines that there is only one way to save him. It's up to her and the entire village to prove to Gaara that he is loved, and Naruto shows Gaara that he does have a friend. #25 - Wind Element: Rasen Shuriken! Naruto challenges Kakuzu with his new technique, the Rasen Shuriken, but can he defeat Kakuzu when his technique isn't even complete yet?